The SeekingKali project that she helped launch with her fellow collaborators Ria Vanden Eynde of Belgium and William Evertson of USA in 2010 explored connecting their individual creative processes through social media platforms to create bodies of work involving traditional and non-traditional art forms. These social media platforms quickly became virtual studio spaces that the three artists used to invite other artists to come into and collaborate. As hip and revolutionary as Warhol’s Factory, their studio blogs have attracted artists from around the globe housing such projects as Seeking Kali and The Medusa Gaze as well as generating and linking live art exhibits in dozens of cities around the world. " Copyright 2005 by Susan Shulman. All Rights Reserved. No part of this website, text and images may be reproduced or transmitted in any form or by any means, electronic or mechanical, including photocopying, recording, or any information storage and retrieval system, without permission in writing from the publishers. 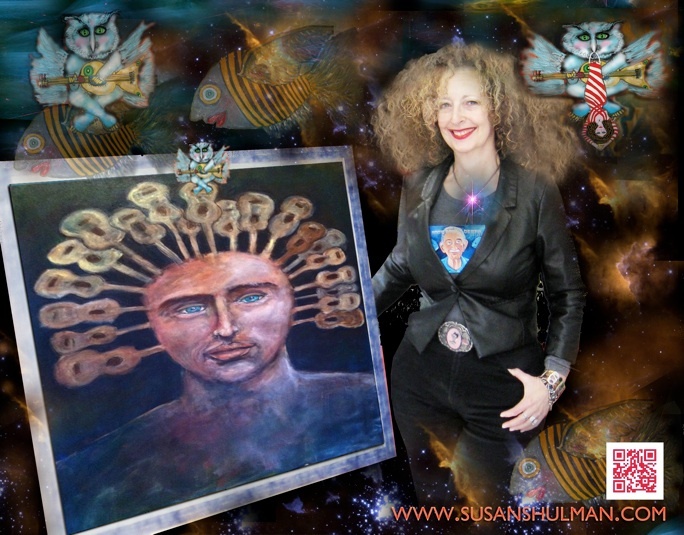 Susan Shulman studied at the Musée des Beaux Arts de Montreal, the Saidye Bronfman Center For The Arts, and received a BFA with distinction from Concordia University. As painter and visual artist, Susan has been prolific in creating bodies of work in both traditional and non-traditional art forms. over the last several years she has gone on to explore connecting her individual creative processes through social media platforms. her art has been at the forfront of many unique art projects, notably the world wide art movement “a book about death”, in the co-creation of the virtual studio space “Seeking Kali” and the exquisite corps blog “metaclimb”. To date, Susan has had ten solo exhibitions and her art has been displayed in over thirty gallaries locally and abroad. Her recent works have been exposed in, Australia, Brazil, Belgium, Croatia, India, Italy, Serbia, the United Kingdom and the USA.